Heading out of the station, and finding where my bus would depart from was not easy. Unaware of the tiff between BEST and NMMT, I headed straight to the BEST bus station. A BEST Traffic Inspector posted at the bus station coerced me to use a non-AC BEST bus instead. Determined not to fall to his encouragement, I decided to check out with a couple of road-side vendors. The vendors said that the NMMT bus would be parked near the railway FOB. I headed to the spot, and was joyed seeing an NMMT supervisor standing. There were lots of passengers standing around the area - I wasn't sure if they were for the bus, or just waiting for someone else. There was no sign of the bus anywhere - just went and casually enquired with the supervisor if a bus was expected soon - he replied in affirmative. Not much after I had this talk, a red-coloured monster appeared at a distance. The bus was pretty crowded - the driver briskly moved the whale through a sea of auto-rickshaws, and parked the bus on the side of the road, close to the footpath. I admired the way the new driver handled the bus at a tight parking. The bus that took me on the first NMMT Volvo experience. The bus was MH-43-H-5118. The crowd inside was admirable - the bus emptied in under a minute, and filled in another minute. I walked around clicking pics of the bus - with a traffic constable looking at me with a similing face. The bus crew weren't able to hide their amazement at seeing someone photograph their beast. After mandatory photographs, I decided to head inside. Sad! All seats were taken! I enquired if the next bus would turn up soon - the reply came "40 minutes later". Forty minutes was too long a time, and my return train would start at 2230 - I need to reach Vashi fast, and carry my baggage to the station. I decided to take a chance - and got into the bus. I was all prepared to travel standing for the next hour to Vashi - after all, its a Volvo! But wait - did I see an empty seat at the middle? Yes! There was one empty seat - the one perpendicular to the direction of movement. I grabbed it in no time. The bus started from Bandra at around 1730. There were quite some standees inside when we started. The driver stopped outside the BEST bus station, and picked more passengers - much to the anger of the BEST inspector posted there. The driver slowly glided through the badly crowded roads, controlling the beast well. The AC wasn't appearing very powerful - but that was because the vent right above my head was closed. It was too high, and I had no option but to let it be. The bus was pretty crowded by now - atleast 20 standees. The conductor came around selling tickets - he did have an electronic ticket vending machine, but not the smart uniforms that the conductors in Bangalore or Chennai wear. This guy was clad in the drab Khakhi uniform. The ticket to Vashi set me poorer by Rs. 28 - a price worth it. The driver appeared desperate to get an empty stretch, to let the beast loose. We were crawling through heavy traffic around Sion in about 20 minutes from start of the journey. The music system was playing out a popular radio station, dishing out latest chartbusters. Quite a lot of passengers alighted at Sion and Chembur - signifying the need for an AC intra-city travel in more routes in Mumbai. The NMMT Volvo just got its route and timing right. The bus never got empty through the journey, and we had standing passengers all the way. The bus entered the more-or-less empty stretch after Anushakti Nagar very soon. The driver let the beast loose, and we were doing no less than 80-90 kmph in most stretches. We slowed down as we reached Vashi. The bus dropped me at Vashi, exactly at 1829 - exactly 59 minutes after we set off from Bandra. The travel time was absolutely amazing, given the fact that the journey was right at the peak hour. The number of passengers inside the bus was amazing - truly amazing for a new service. 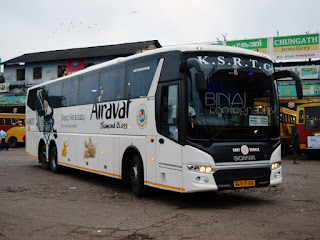 Recent newspaper reports suggest that the service is indeed a hit, so good that it forced BEST to start its own version - albeit costlier - using their new King Longs. NMMT operates 11 Volvos on this route alone - giving a clue of the popularity of this route. 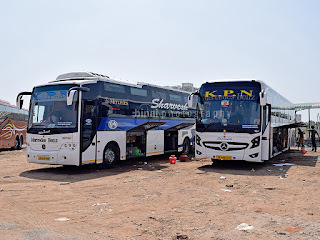 These buses, on route 105, takes 80-90 minutes to the cover the 34 km distance from Bandra Railway Station (West) to CBD Belapur, via Sion, Mankhurd and Vashi. The end-to-end fare is Rs. 45. Such services are the only way out for cities with heavy vehicular traffic like Mumbai. Get more of these buses, and incentivise car owners to leave their fuel guzzlers at home. Save Mother Earth, start using public transport. 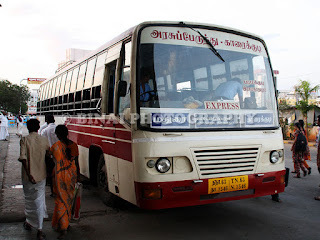 Great observations and notings of our great 105 NMMT AC buses. I don't remember seeing you on one that I usually am on...the BKC route special bus. My journey started on the 19th of September and am still honestly using the service more as an obligation for the kind gesture of the authorities towards me. 19th Sept from Maitri Park to Bharat Nagr at BKC and asked the gentleman at the window if the BKC route would be stopped. He said -"NO" and not "I don't know". From Monday, I waited very sincerely for three days at the stop but there was no sign of the buses. Their plans had changed and all the BKC buses were discontinued.I was very upset.I somehow got the GM's phone number and blasted. But, I regret, as these people are so sweet with you that I just cannot get angry on them, even though I have to wait for an hour at the bus-stop for the bus that is scheduled to leave Bandra at 5.45 p.m. They go on telling me, Madam..we are going to ply this bus only till your quarterly bus exists and then you will have to come to Kala Nagar to catch the bus.. I say, I wish I could do that even before my bus pass got over. Now as an obligation I sincerely wait at the ICICI stop for the bus. I have different plans now...I will take the BEST smart card pass of Rs.1000/- and then jump buses as and when I want and stop the waste of time at the stops. (NMMT is cheaper than BEST)but it is more important to save time than money. Anyway, Binai,hope to bump into you on our great bus journey sometime. I am the little friendly,talkative,elderly lady (with vitiligo)in her 50s. During my days in Belapur, NMMT never responded to people's request.